In Scotland grain whiskey is a whiskey that uses either malted or un-malted cereals in the mash in addition to malted barley, and/or uses a column still. Grain whiskey is distilled in a manner that produces a higher ABV although typically a less flavorful result than a product derived from a pot still. Due to this most, but not all, grain whiskeys are used to create blended whiskeys. 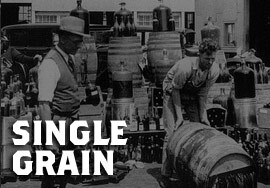 It should be mentioned that the term "single" refers to the whiskey being produced at a single distillery, not from a single type of grain.